Please read the information sheet that supports this document. C.Vs will not be accepted. Where did hear about this post? Please complete schools and colleges attended from the age of 11 years. Please list any additional qualifications. Please give details of your most recent employment first. Please include any work, full or part time, paid or unpaid. Please state clearly the first date of your membership, and the first date of your registration and/or your accreditation. Please tell us why you would like to work with Oasis-Talk in delivering Primary Mental Health services. Please use this page to tell us your personal attributes and experience. Please address the essential and desirable requirements listed in the job description. We would like to know of any areas of particular interest and expertise that you have. We would like to know about any CBT experience and training that you have. Please tell us the strengths and skills you would bring to this post. Please continue on the second sheet if necessary. Oasis-Talk is an equal opportunities employer. We welcome applications from all sections of the community. Do you require a permit to work in the UK? By signing this document you are declaring that the details in the application are true and can be verified. By signing you are agreeing that any enquiries may be made or documentation requested to substantiate the statements made by you. Please be aware that failure to give complete and accurate information may result in loss of future employment or withdrawal of a job offer. 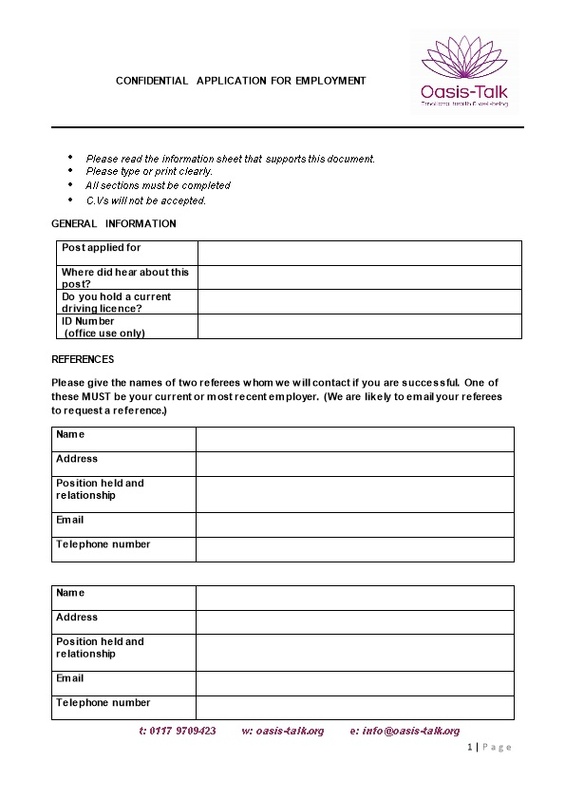 If you are emailing this application form to us, then in the absence of a signature, you should be aware that the emailing of your application constitutes your personal certification that the details in the application are correct. Oasis Talk is committed to pursuing a non-discriminatory recruitment policy. In order to ensure that we are treating everyone fairly we need to collect and monitor certain information about all applicants. Please could you help us with this by completing the following questions. All information given on this page will be treated in the strictest confidence. Disability – do you consider yourself to be disabled? If you have chosen not to complete this page, your application will not be affected in any way. Thank you.